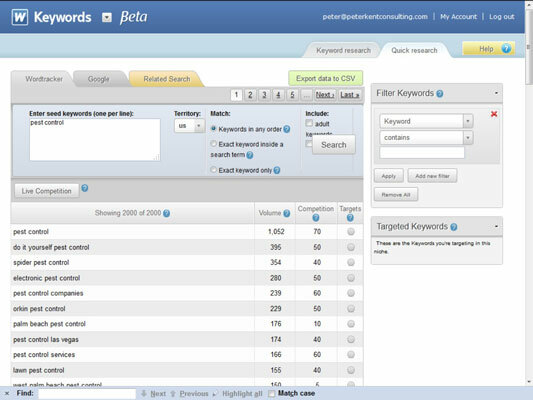 Wordtracker is perhaps the most popular commercial keyword tool among SEO professionals. Wordtracker has access to data from a couple of large metacrawlers, and a large British ISP. A metacrawler is a system that searches multiple search engines for you. For example, type a word into Dogpile’s search box, and the system searches at Google, Yahoo!, Bing, and Ask.com. Wordtracker’s database has hundreds of million searches from the last 365 days. Wordtracker allows its customers to search this database. Ask Wordtracker how often someone searched for the term rodent, and it tells you that it was searched for 60 times over the last year but that the term rodents is far more popular, with 269 searches over the last 365 days. Wordtracker also allows queries using the Google keyword tool to get Google’s information, too (though the data is modified slightly). Remember that certain searches are seasonal: pools in the summer, heaters in the winter, and so on. In the past, Wordtracker had only the last 100 days of information, so it wasn’t representative of a full year for some terms. Now, however, it has a full year, so some terms may be diluted; christmas tree decoration, over a full year, is less popular a term than it would be if you searched through data from just November and December. You can download the list of keywords you find in a CSV file that you can quickly open in your spreadsheet program (such as Microsoft Excel). On the face of it, Wordtracker may seem much the same as the Google tool, but it does have some additional features that help you manage your keyword lists. It allows you to set up campaigns (each website might be an individual campaign, for instance), and, within each campaign, multiple projects (each project could be a particular keyword focus). 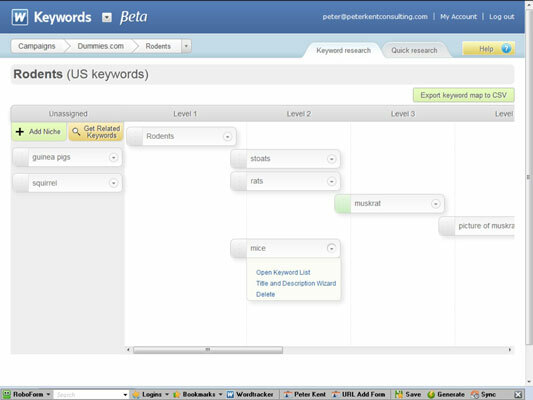 Then you can search for keywords and save the lists into your projects. You can also add ranking reports to the projects. In other words, Wordtracker will go and check the position of your site in Google for up to 100 keywords; you can even have Wordtracker tell you how well your competitors rank for those keywords. The project page also contains a panel with some basic information about your website; whether Google and Bing have indexed your site and even whether you have errors on your site. Wordtracker also has an interesting Keyword Mapping screen, which lets you build keyword hierarchies that may help you visualize your site from a keyword perspective, grouping pages according to keywords. You can then add your own words, and for each word, Wordtracker builds another list. Within seconds, you have a variety of terms, each with a list of dozens, if not hundreds, of associated terms. You then drag the terms onto the hierarchy as you see fit and open each term to view the full list. 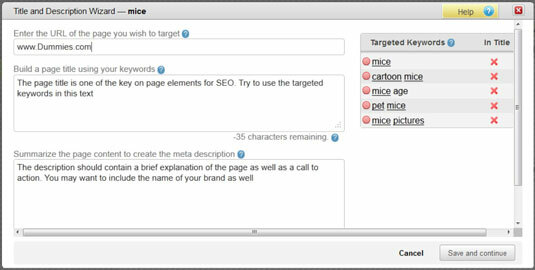 You then select the keywords within each list that you want to target. The next step is the built-in Title and Description wizard, which helps you quickly create page URLs, HTML Titles, and Description meta tags for the keyworded pages you’re going to build. When you click the Export Keyword Map to CSV button, you end up with a spreadsheet containing a line for each page, with each page’s URL, Title, and so on. Of course, you can then add any information you need before handing it off to the developer. Wordtracker is well worth the price: $69 for a month or $449 for a year. Anyone heavily involved in the web and search engines can easily get addicted to this tool.